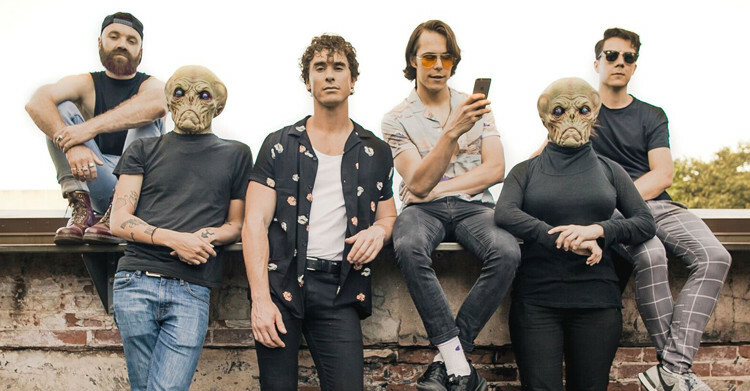 After playing a sold-out Alexandra Palace gig in late 2017, Don Broco have been relatively quiet, creating what we now know to be their third studio album, Technology. But now the band are back with a headline tour across the UK. The Bedford Pop-rockers became prominent with their debut album Priorities, which took them into the top 30 album chart back in 2012. Soon after, in 2013, they released ‘You Wanna Know’ as a single, and by the end of summer 2015 Don Broco had released their most popular studio creation as of yet with their second album, Automatic. The 4-piece are known for their energetic and exciting live performances, often exaggerated with eclectic light shows and lively interactions from each of the band members. Don Broco have supported the likes of Young Guns, You Me at Six and Bring Me The Horizon on tours across the globe, but the band are certainly no strangers to headlining themselves. The year after their debut album was released, Don Broco found themselves playing a mainstage slot at Reading and Leeds 2013, and headlined Kerrang!’s tour two years later, with support from the likes of Bury Tomorrow, Beartooth and We Are The In Crowd. More recently, Don Broco began working on their newest studio album Technology for release on the 2nd of February. So far, the band have teased fans with hard-hitting singles such as ‘Pretty’ and ‘Stay Ignorant’ alongside what looks to be the lead single, which shares the album’s title. One track ‘T-shirt song’ was debuted live at Alexandra Palace, their only gig of 2017. At the time, frontman Rob Damiani explained the song’s description of his battle with depression. The song relates to him hearing the Baywatch theme play in his favourite club, and how joining in with the men around him taking their tops off and having fun began to make him feel better. Their headline gig at Ally Pally was their biggest in the UK so far, and so it will be interesting to see how the band will perform in smaller venues. They begin a string of performances with a gig at Portsmouth Pyramids on the 8th of February, continuing to venues such as O2 Academy Bristol on the 9th, Norwich U.E.A on the 12th, Rock City in Nottingham on the 13th and the Garage in Aberdeen on the 20th. The band will be bringing along some fresh new songs from their album to this tour and I’m excited to hear what they have in store. If the current singles from the album are anything to go by then it certainly won’t be a disappointment.